Saltaire is a step back in time but with modern amenities and with both fresh water and salt water access! 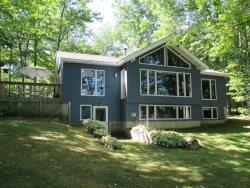 A covered porch, 1.5 miles to Boothbay Harbor, cool breezes and close to walking trails! Relax and feel renewed energy while smelling the "salt air" and enjoying a bird's eye view of Linekin Bay. With that new energy, head down the stairs to your dock and float to dangle your feet in the water, swim, drop a line to catch tinker mackerel or wave to a passing seal as he pops his head out of the water to say hello! Mackerel is great eating. Or head up the stairs and walk straight ahead to swim or kayak or just sunbathe on the beach of Appalachee Lake. Saltaire has the rare distinction of salt water on one side and freshwater and sandy beach on the other. The best of both worlds. With all that water, you can swim, fish, bird watch, kayak, canoe, watch the sunrise, the sunset, the eagles and ospreys! The Boothbay Region Land Trust offers some great walking paths nearby too. As the name implies, the salt air is all around you at this traditional Maine Log Cabin. Wake up to warm sunrises and fun-filled days in this beautiful, quiet woods setting as part of the Apalachee Community. A community of log cabins, built around the lake and oceanfront. One of our many small, friendly summer communities where people have owned their cottages for generations. This one-floor, three-bedroom log cabin affords wonderful views of Linekin Bay and even has its own private deep water mooring, dock, and float. There is also access to the Appalachee Association fresh water beach, along with other amenities, just a short walk up the driveway. A covered porch provides a spot for relaxing and enjoying the views and is perfect for alfresco dining, morning coffee and evening cocktails as you take in the cool summer breeze off the bay! This cottage is only a short drive into downtown Boothbay Harbor and the rest of the Peninsula for shopping, dining, boat trips, golf, mini-golf and so much more. Built into the side of a hill over Linekin Bay, Saltaire is a traditional Maine summer cottage. Most of the walls, floors and vaulted ceilings are made from local wood logs. The river-rock fireplace, mantel, and hearth is also a favorite style here in our neck of the woods. The covered deck and custom-made furniture pieces take you back to a different time. A time when the pace was slower, people said hello to each other when they passed on the road and everyone knew your name at the post office. Take a step back in time in this beautiful single story cottage. The beautiful views from this cottage are possible as it perches, below the road and parking area, above Linekin Bay. There are steps leading down to the house from above, please keep this in mind when planning your trip. There are no elevators or ramps to help with unloading your vehicle or getting your guests in and out of the house. This utilitarian kitchen has everything you will need for your week on the coast, including a lobster pot, crackers, and butter boats! The living spaces are nicely appointed with homey touches lovingly supplied by the owners. Cable TV and Internet are included. One bedroom has two single beds. One bedroom has a trundle with pullout. One full bathroom (with bath/shower combo). One half-bath attached to the bedroom with the trundle. The Boothbay Peninsula is a beautiful region rich in culture, steeped in maritime history and of course its own unique coastline of bays, tidal rivers, and open ocean access. The area offers ample opportunities for biking, kayaking, canoeing, fishing, charters and guided cruises, spas, golf, mini-golf, bowling, museums, antiquing, hiking and walking trails. We have the Maine State Aquarium, the Coastal Maine Botanical Gardens and the Boothbay Region Land Trust with its 30+ miles of pet-friendly trails in protected areas. For a more comprehensive list of local offerings Click Here! The members of the team, especially Lucy (with whom I had the most contact), were great. If we come again, I will know to rent a cottage much earlier in the year to have more choices. The stay was quite relaxing and once we got the fans, the cottage was pleasant. However, the middle bedroom with the trundle was quite tiny and the trundle had to be put back every morning so there was room to walk around. The bathroom was bare bones but it did the job. Good water pressure. Type of Waterfront: Two Types at this property, both fresh and salt water. The walk down to the Dock & Float along Linekin Bay is steep with many stairs. Access to Linekin Bay would be via the float. Appalachee Lake is a freshwater beach (Association Beach so shared) across from the cabin, just a quick walk. Swimming Area Rating: Saltwater = 1/5 Swimming off dock only due to a seawall or rocky/wooded shoreline. Freshwater = 5/5 very easy water access, sandy or pebble beach, great for all ages! Bed Sizes: (1) King (4) singles, 2stand alone and 2 in a trundle.